There is no doubt about it, I am not shy when it comes to expressing what I love in life. As long as we are talking, it is no secret that Meka Nism is a magical band of beautiful people. And this reminds me why I love this industry so much. That is why I am here to express my eternal respect for the band Meka Nism. On Tuesday, January 19th, 2016, the band dropped a live CD from their recent tour with Trapt that can be downloaded. With me being a huge fan, I downloaded the album right in the morning on my Samsung Galaxay 5 phone through Google Play. (Don't worry. That was not a plug. LOL) This CD was recorded at the infamous Machine Shop in Flint, Michigan where familiar acts like Halestorm, Nonpoint and now Meka Nism has played. Many are quoted as saying "The Machine Rocks!" Or you may hear that this is the place for bands to play or where a music fan needs to check out their favorite acts. Meka Nism graced the stage at The Machine Shop on December 12, 2015. This album consists of their amazing songs from both of their EP's : "The Dance at the End of the World" and "The Shift." Now, I have listen to both of the EP's and love them both. The live CD takes these exceptional "art metal" songs to the next level. Seeing and hearing Meka Nism is an experience. (Read my review at Boondocks in Springfield.) And the live EP brings it. Again, Meka Nism takes the world of metal and produces music that is very unique. Meka, Reed, Alvin, Bobby, Jay and Jeremy will be having such a wonderful ride in 2016. I know many new fans will want to join "The Tribe." 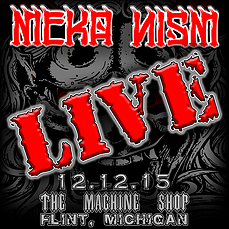 So, go and support Meka Nism by downloading their new live EP: Meka Nism "Live at The Machine Shop 12.12.2015". You can get it on ITunes, Google Play, Spotify and CD Baby. I highly recommend downloading this CD. It would be great for your soul and your music collection. #Cheers to Meka Nism and all the success they will have in 2016 and beyond!!!! !